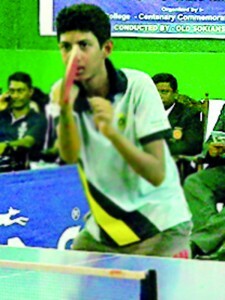 Udaya Ranasinghe of Vidyartha College Kandy and Erandi Warusavithana of Dharmasoka Ambalangoda impressed by winning the Most Outstanding Player awards for boys and girls respectively, at the Damso Junior All-Island Ranking Table Tennis Championship, which ended in Ambalangoda last weekend. Udaya, who produced a stupendous performance at the recently concluded Junior Nationals, continued his top form to clinch his second main award for the year at the tournament, which was held as part of the centenary year celebrations of Dharmasoka College, Ambalangoda. Udaya won the Under-18 and Under-15 boys’ singles championships, while Dharmasoka’s Erandi went on to claim her maiden main title for the year by winning the Under-18 girls’ singles event. Krishan Wickramarathne in straight sets to win the Under-18 boys’ singles title and bounced back after losing the first set to record a spectacular 3-1 win against Prasad de Silva in the Under-15 Singles final. These wins earned him the Most Outstanding Player. Meanwhile, Chamathsara Fernando of Girls’ High School Mt. Lavinia pulled off an encouraging win against Ridmi Karandanaarachchi of Mahamaya College Kandy by three straight sets. Hosts Dharmasoka Ambalangoda had the distinction of winning three more age categories. 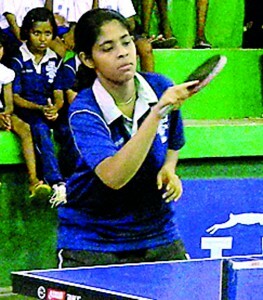 Imasha de Silva had the privilege of keeping the Girls’ Under-12 Singles championship in Ambalangoda when she went on to beat Samadhi Hettiarachchi by three sets to one in the final. Helitha Hendavitharana beat his teammate Veron de Silva to win the Boys’ Under-12 Singles title in an all-Dharmasoka final while Hiruna Warusavithana had the comfort of winning the Boys’ Under-10 Singles championship beating Yasiru Maleesha of Vidyartha Kandy in straight sets. Dharmasoka paddler Minduli Dihansa had the honour of qualifying for the Girls’ Under-10 Singles final but Sanduni Prabuddika of Prajapathi Balika Vidyalaya turned the tables by snatching the final in a thrilling three sets to two victory.